Unique Setting - Diamonds or other gemstones, flank the main stone for additional sparkle or color. Popular unique settings include 'channel', which protects stones by keeping them flush, and 'bar-channel', which allows more light to enter the sidestones. Three Stone - One diamond for the past, one for the present, and one for the future. Typically, the center diamond is larger than the two side stones. The sides may also be gemstones for color. Pave (pah-vey) - The main stone is surrounded by tiny diamonds to add sparkle and the illusion of greater size. When it comes to choosing the perfect ring style, consider her lifestyle, and how well a certain setting will fit into it. If she's more active or outdoorsy, look for lower profile, less ornate, more sturdy choices, which are less likely to get knocked or caught on things. If she's more of a glamour girl, look for statement settings, with a higher stone profile and more intricate ring detailing or unique motif. You will be confronted with a dizzying array of choices when it comes to engagement rings. Have a price range in mind. 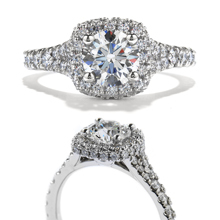 Going in with fairly specific parameters will help us find the right engagement ring to fit your budget. 2. What kind of jewelry does she already wear? If she wears rings, borrow one she already owns. Tell her you are going to have it refurbished. You can also press the ring into a bar of soap for an impression or you can also slide it down one of your own fingers and draw a line where it stops. We can use these measurements to identify her approximate ring size. 4. Are her preferences hard to pin down? Consider buying an unset diamond. If you choose the diamond first and have the setting made later, you can include her in selecting the style and final details of the ring (always a good idea) and avoid the awkwardness of choosing a ring that's more to your taste than hers. She will be wearing this ring 24/7 every day of your married life. It will need to go with everything from jeans to evening wear. If you're uncertain about her shape preference, it's sensible to stick to the classics. They became classics because they appeal to most people most of the time. Shapes with fewer facets, such as emerald or square, require higher clarity. The fewer the facets, the more visible any inclusions will be. Certain shapes pair more successfully with other gems in multi-stone rings. Round, Oval and Marquise all work well. Pear and Heart shape are more challenging.